Justin's WeatherTalk: You win! 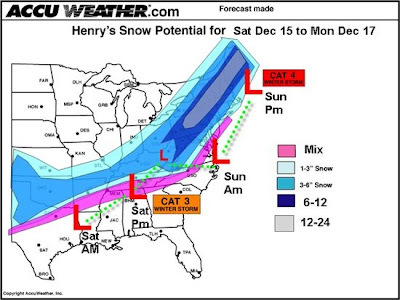 The Early Snowmap and another model. The 1st Snow Poll is now closed. I was surprised at the response to not show the early map, yet then final surge just barely won 54 to 50. 20 of you would rather wait until after the storm. Well, here it is, but small enough for those of you who don't want to see it. THIS IS NOT MY FORECAST! I don't know this forecaster, but it came from an Accuweather forecaster on Tuesday. It shows Baltimore in the 3"-6" range. I'm curious to see if he has changed his outlook since then. Again, if you click the image, you may have trouble backing up here. Copy URL and paste back in browser - sorry. I am off work on Friday I will make my first call here during lunch time. 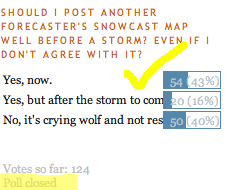 I have posted a new Snow Poll at the right. Here you can share you're best 1st guess of total snow (not including ice, etc) for the Baltimore area. This does not include the northern snow-burbs, but the official report at the airport on Sunday night. I'll run another one on Saturday as well to see if you change your mind. More Model Support. Here is a 75 Hr forecast from the SREF my buddy Tony Pann sent me. This is for Sunday afternoon and holds the morning GFS idea. Notices the coastal Low over DE, and MD is on the back side. This looks like the primary, with no occlusion or transfer. 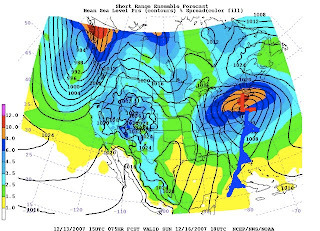 This would be in response to a strong block to our north. I'm sure the message boards are lit up this evening with renewed hope.